Barry Kirwan Blog: Which is the better medium for science fiction, book or film? Which is the better medium for science fiction, book or film? 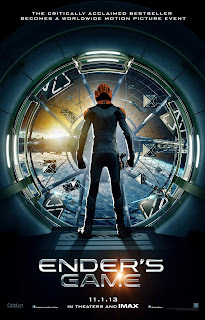 I recently watched Ender's Game at the cinema, and while I enjoyed it, it didn't leave the same impact as the book by Orson Scott Card. And then I watched Gravity, and was blown away. You get to know the characters much better in, say, 40 hours, than 2 and a bit. 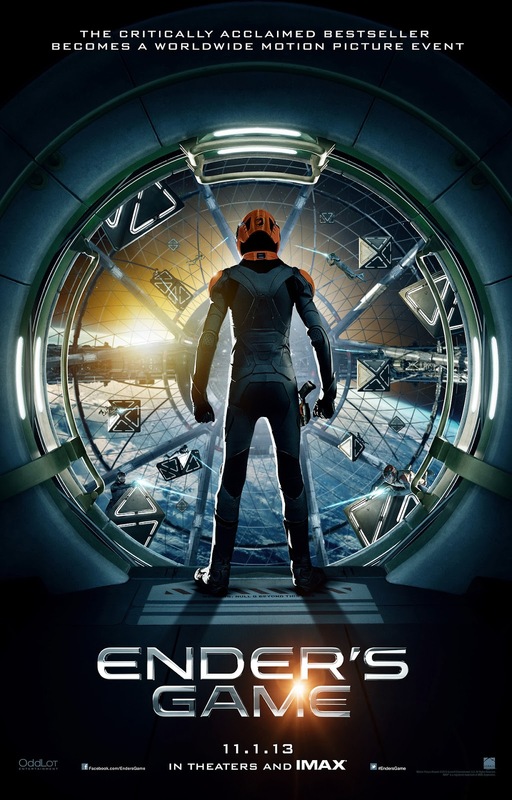 Orson Scott Card writes good characters as well as good plots, but in the space of a film, the latter can get lost in the action, or else there's just not enough time for a character as subtle as Ender. Whilst I'm a Harrison Ford fan, I can barely remember the character he plays in the book yet he steals the show in the film, whereas the character of Bean is stronger in the book, but downplayed in the film version. This also means that in books, you can get to know many characters. In films this is difficult. The solution for science fiction (ST, Babylon5, Battlestar Galactica) and fantasy (Game of Thrones) is series, where you have the time to get to know a range of characters. Also, in books you can often read directly what the character is thinking (e.g. via 'interior monologue'), whereas in film this is much more difficult, except via voiceover, which is usually pretty awful. This means you sometimes feel you know and understand characters from books better than people in real life, because you know what and how they honestly think. There is an intimacy that is hard to achieve in films, sometimes even in life. You decide what they really look like, guided by the author. There are some authorial 'brush-strokes', but as a reader you fill them in, based on what you think they should look like, based more on who they are than the usually scant descriptions. A film has to find a living actor who personifies the character. That can be really hard, especially for such a famous and well-known book. So, while I thought Harrison Ford was well-cast, and Ben Kingsley utterly perfect as Mazor Rackham, for me the central character of Ender wasn't how I remembered (pictured) him from the book(s). For an entirely new audience this won't necessarily matter, of course. So, where do films outstrip books? I was blown away by Blade Runner, still one of the best science fiction films of all time. Incidentally, in my view it was a heinous crime that the Oscar for special effects that year was given to the film Gandhi (a good film in its own right) rather than Blade Runner. The visions of the protagonist (Harrison Ford, again) flying over a megalopolis are still in my head 25 years later. Science Fiction films (and series) often show great detail in their world-building, visual detail that might get too ponderous to write or read in a book. I loved the book Ringworld, for example, but it was thrilling to see it envisioned (albeit on a smaller scale) in the recent film Elysium. As a writer it is quite hard to describe new space-ship ideas as there are so many 'tropes' out there already, in books, films, and in people's heads. Films can now do this very well thanks to CGI, and Ender's Game is no exception. Any science fiction fan gets high on seeing big, detailed ships sailing through space. And when they get destroyed, as in the shredding of the International Space Station in Gravity, it's done so well you just sit there in awe. 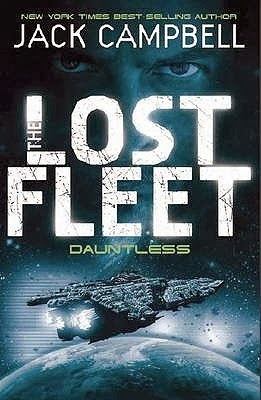 Again, writing such detail is harder in books, which is why we try to have good cover art of space-ships on our books. So, this was where Gravity really impressed me. I've written scenes where one of the characters (Micah) is tumbling through space, running out of oxygen, trying not to throw up, the stars spinning away from him, his space-vessel drifting into blackness, and he's terrified of dying alone in pitiless vacuum. Now, go and watch this happening to Sandra Bullock in Gravity. The sounds, the cinematography, the sense of panic, the vision of what she would see... Flawless. Watching it like that has high intensity. This takes one of the author's maxims 'show don't tell' to its extreme. Bravo! Newton should have written science fiction. His laws of motion affected by gravity still apply. 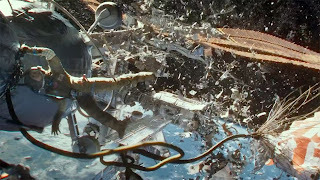 Until Gravity, when watching movies where people are moving around in space, I always disconnected a little as a viewer because often the motion would not be realistic. It would be two-dimensional. What I mean is, for example, that a guy in a space suit would kick off from one ship to grab hold of another thirty meters away. So, Newton would say, hang on, both ships are moving relative to each other, and the momentum you have when you reach the other ship doesn't slow down, etc. In the film Mars they had a good attempt at portraying this but it somehow looked amateur, unconvincing. In Gravity, however, you get to realise just how difficult movement in space is. I think Newton, somewhere, might be saying 'Finally, they got it!" It is 4D because everything is moving in time as well. Poor Sandra can't seem to grab onto anything, and she and George keep getting biffed around by parts of the ship that are moving and have a helluva momentum of their own. Do films replace books? Of course not. But for the first time I think films have an edge in the intensity of the visualization of what other worlds and space ships and movement in space would actually look like. The challenge for film-makers is to make space battles 'realistic' from a physical science perspective. Not ships flying close up and blitzing each other with particle beams as in Star Trek and a host of other series/films, but ships using long distance weapons and temporal effects of near-light speed to their advantage, as in the book series The Lost Fleet. That's probably not going to happen soon, because it won't have mass appeal, and will be harder to understand. But it will come. And then maybe Iain Banks, rest his soul, author of many brilliant realistic battle scenes in books such as Excession and Consider Phlebas, can also say "Finally, they got it."